Working with Animated Timer - Atomi Systems, Inc.
ActivePresenter 7 new version gives you more new features and enhancements for eLearning designing. One of the amazing features is Animated Timer which plays an important role in the success of eLearning task. Basically, Animated Timer is known as a time-counter which you always need for quizzes and eLearning courses. Creating a sense of urgency, tension, or pressure. Simulating practical tasks that involve time constraints. Making activities more interesting and enjoyable. Creating timed skill and drill exercises. How to Use Animated Timer? In general, Animated Timer is simple to use, even when it is the first time you make use of it. 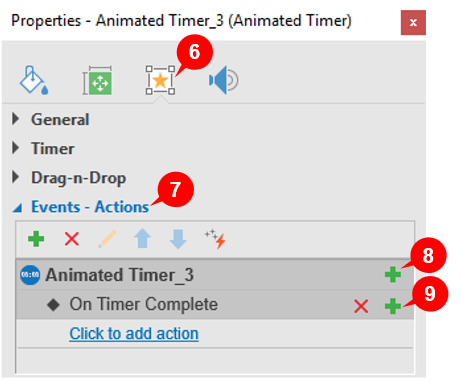 Let’s get to know how to work with Animated Timer in ActivePresenter 7. Step 1: Go to the Interaction tab and click Animated Timer. Now, you’ll have two choices to insert: Timer or Progress. Step 2: Select either Timer (1) or Progress (2). It will be inserted in the slide that you are working with. Firstly, we will learn to use Timer. After selecting Timer, on the Canvas, Timer presents with digital default display consisting of 2 sides. The left side is Minute and the right side is Second because we are using MM:SS default type. To change default display of Timer, go to the Properties pane > Timer > Format. In addition, ActivePresenter enables you to adjust more with Timer section. 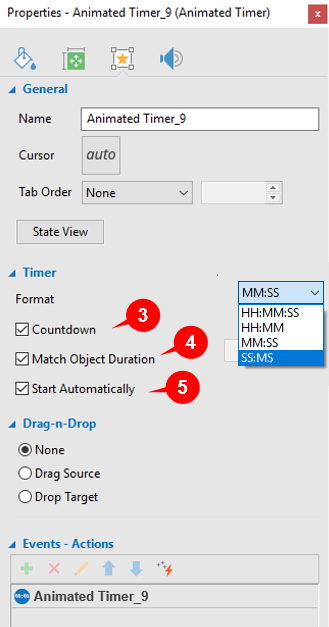 From Timer in the Properties pane, there are three check boxes: Countdown (3), Match Object Duration (4), Start Automatically (5). Countdown: Helps you set countdown for your Timer. Check the box to make Timer count from specific number to zero. If not, Timer will not count down. For example, when you set time in 3 seconds and check this box, the timer will count from 3 to 0. If you uncheck this box, the timer will count from 0 to 3. Match Object Duration: Supports you set the equal duration between Timer and Object. If you check this box, Timing duration will equal to Object duration and the timer will count simultaneously with the Object. When you uncheck, Object duration will appear on the right side and you can change it as you want. Start Automatically: Allows how Timer is worked. If you check box, the timer will be active immediately when it shows on main timeline. If you uncheck this box, you may have to use Actions to control Timer. And how to work with Actions for Timer, we will show you later. Tip: If you want to change or create your own Timer style, click Format. It is the same way when you work with objects. There is another way to work with Animated Timer, it is Progress. After selecting Progress, you will see a progress bar appears on your screen. Go to the Properties pane for more changes. The way you are working with Progress is similar to the way working with Timer. Nevertheless, Progress will not show the number of Timing duration on the screen display. It just can be seen on the Properties pane. While your Timer is working but you want to work more with your slide, adding Events and Actions is your solution. Together with default Events and Actions that ActivePresenter offers to you, Animated Timer has its own Events and Actions. Let’s see how amazing it is. Step 1: Go to the Interactivity tab (6) in the Properties pane. Step 2: Access the Events – Actions (7). 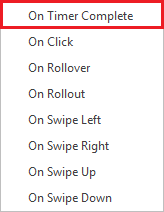 Step 3: Hover the mouse over the Animated Timer title and click the Add Event button (8). Next, select one out of 8 available events from the pop-up menu. ActivePresenter offers a new event for Animated Time. It is On Timer Complete, which occurs when the Timer finishes. For instance, if you create a quiz and you want to show the answer when time’s up, use the One Timer Complete event and choose suitable action. After selecting, you can see On Timer Complete event entry appears below the Animated Timer title. To begin with, click Click to add action and select one from the action list. ActivePresenter 7 gives you 30 actions to choose. Therefore, if you want to add more actions, click Add Action (9) then repeat the procedure. Start Timer: Makes Timer start counting. Pause Timer: Makes Timer counting can be stopped temporarily. Stop Timer: Makes Timer stop counting. For example, when you select On Click event and Pause Timer action (In Miscellaneous), so counting Timer will be paused as soon as you click on Timer display. This is useful for creating quizzes that timer will be paused just as the learners give answer. Tip: ActivePresenter 7 allows you to add more than one action to an event easily. In that case, actions will take place in the order that you insert. To change an action’s order, select it and click the Move Action Up button or More Action Down button to bring an action up or down one level respectively. 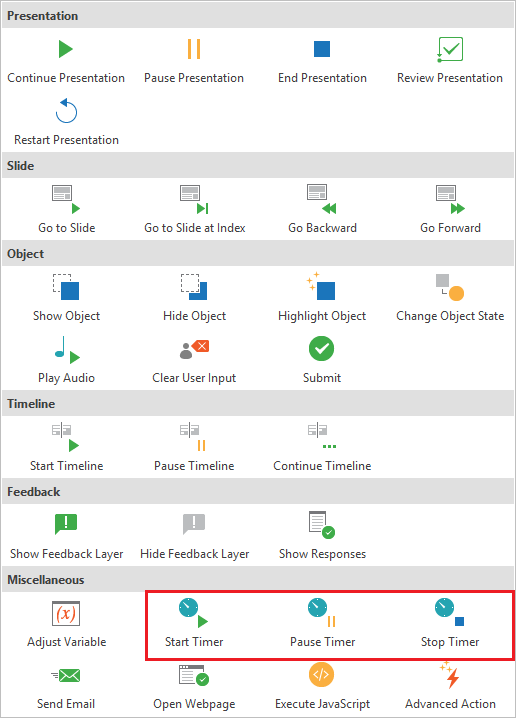 Take a look at Working with Events – Actions to know how to add condition to Actions, remove Events or Actions or even more. So, it is all about Animated Timer that offers to you in ActivePresenter 7. Hope that you will find it helpful in creating effective interactive content. Stay tuned to get more handy tutorials.